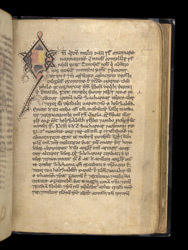 The origin of this manuscript of the Gospels is uncertain, but it has been attributed to Armagh in Northern Ireland on the basis of its textual similarity to 'The Book of Armagh' (in the Library of Trinity College, Dublin), and its artistic similarity to 'The Gospels of Mael Brigte' (in the British Library), which was written in Armagh in 1138. The start of the Gospel of Luke is introduced by a large stylised initial 'Q', incorporating a profile animal head and foot. The initial must have drawn (or at least sketched-out) before the text was written, because the scribe has allowed space for the lower part of the initial to project into the text space.